Paul Revere formed his first band in Boise, Idaho in 1958 soon after getting kicked out of school. He originally called them The Downbeats but later Paul Revere and The Raiders. Whilst he owned a drive-in restaurant he befriended an 18 year old bakery delivery man Mark Lindsay whom he eventually recruited to his band on vocals. In the Spring of 1959 Paul headed for LA with a taped arrangement of an instrumental called Beatnik Sticks by his band. He was turned down by several companies but eventually got a contract from a guy who owned a pressing plant and put out recordings he liked on his own Gardena label. Later in April 1961 Gardena released an instrumental that made it into the national charts. However, the following year Paul was drafted and the group fell apart. Byrds' producer) and Bruce Johnson (of The Beach Boys). From 1966 when they burst into the national charts with Just Like Me and Kicks (one of the first anti-drug songs) until well into the seventies they enjoyed considerable chart success. In later years they underwent several personnel changes. Although they began in the garage tradition, their exposure following their signing to 'Where The Action Is' killed off their underground appeal pointing them in a pop direction. 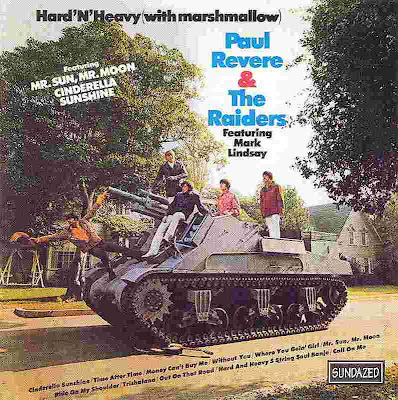 Paul Revere & The Raiders are still going strong as we head into the millenium. Another treasure Mr Oleg !! !